Explore two of Italy’s most fascinating Etruscan towns on a private, full-day tour that takes you through the scenic Roman countryside and back in time more than 10,000 years. 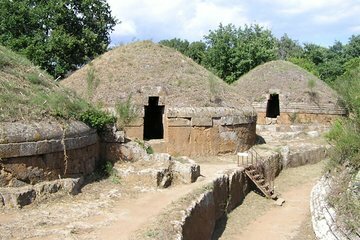 Visit the ancient cities of Tarquinia and Cerveteri, which date back as far as the 9th century BC and are known for their elaborate necropoli and painted tombs. A private chauffeur will share the history of the area and take you to the various sites to explore at your own pace and leisure.